Androlic - this is one of the most potent and strongest oral steroids, developed on the basis oksimetalona. It has an active anabolic property promotes rapid growth and weight gain and muscle. The steroid has a powerful effect androgenic Androlic reception allows athletes in record time to achieve a significant benefit indicators of muscle mass and power. Athlete, taking these pills for two weeks can get up to 5-7kg. During this it means that the athlete a lot of water collects, in addition to the muscle tissue, leading to a rapid increase in muscle mass and volume. Comments on the Internet testify to its high efficiency and fast results. 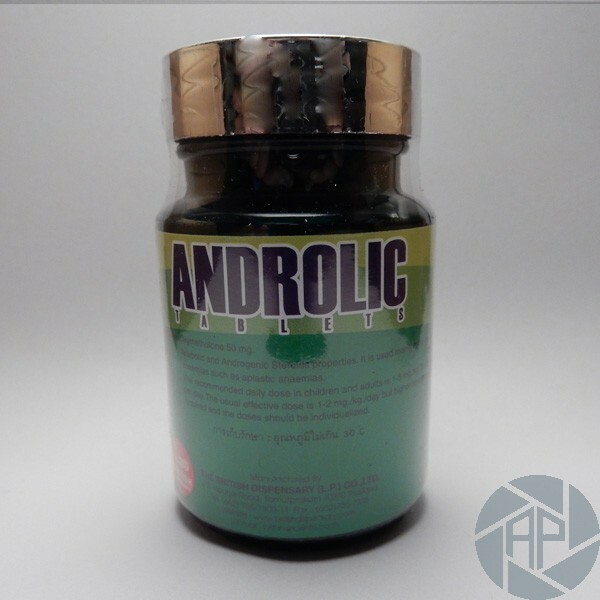 Androlic contributes to the attraction of water in muscle cells, leading to greater accumulation of water in the course of the preparation. This steroid does not give qualitative growth of muscle tissue and provides a purely quantitative. But steroids "lubricates joints," which is important for athletes suffering from joint pain and working with heavy weights. It also helps increase the number of red blood cells; the muscles receive more oxygen. Athletes who use Androlic 50, felt a great surge of strength and do not feel tired during workouts. Overtraining when taking these pills is excluded, as the substance creates the conditions for high physical regeneration. At the beginning of the drug, athletes recommended daily dosage Androlic - 50 mg, which is necessary to increase gradually. A week later, the dose should be increased by approximately twice (100 mg). Tablets generally must be consumed during meals in the morning and evening. It is reasonable to take medicine in an amount of 1 mg per 1 kg body weight, or about 1 to 3 tablets 50 mg per day. The maximum dose of 3 tablets is considered to be anabolic and receive 4 is not recommended even for experienced athletes, because, judging by the comments experienced athletes, a high probability of severe side effects. Athletes whose body is not a rumor familiar with steroids may be in the third week of reception for the daily dose of 150 mg. The same pattern can be glued to the athlete's category of over 100 kg. Androlic high price offset by a tangible effect of the drug. However, it is worth remembering that the course of steroids should not exceed more than 3-4 weeks, as during the reception is a quick saturation of the receptors. In general, you should not take more than 8 weeks. Athletes, good results are obtained, the combination of this drug with Sustanon or Testosterone enanthate with the subsequent transition to shorter esters and stanozolol. This combination helps prevent muscle loss after completion of steroids. Parabolan combination helps achieve a significant increase in muscle mass. This combination, in turn, is prevalent among professional athletes and allows them to achieve high results. These pills are often combined with nandrolone decanoate. This package can also be used to build muscle fast. Also, the reception and recommended Androlic 50 athletes suffering from diseases of the joints. It is significant not only fluid accumulates in the muscle, but also increases the amount of natural lubrication of joints. Anabolic therapy in some cases can hurt the body. If you want to buy Androlic, you should know that this steroid is one of the most harmful drugs. It is toxic to the liver, manifested in violation of their duties. The wrong dose of Androlic 50 or prolonged use causes severe damage to the subsequent liver. Side effects of steroids can also manifest itself in a yellowing of the nails, eyes, hands, and skin. The active drug substance causes a significant accumulation of fluid, which can cause an increase in pressure in the bloodstream. He comments are proof that sometimes the reception causes headaches and nausea. In some cases, the exchange rate, among other things, can cause hair loss and the appearance of acne on the skin. Contraindications to receiving Androlic British Dragon are similar to other oral steroids. It is impossible to accept adolescents, pregnant women, people with heart disease, liver and kidney. It is also contraindicated in patients with cancer, in addition to the elderly.